Useful post about how he expects things to work under screens. Cool display of the iPhone. Screens environment has been updated again. More tech stuff, but another mention of Safire. I wonder how long till we see a screen shot or two? Screens Environment: Safire in a few months? There's another update from Screens Environment. As usual it is stuff that I don't really get (maybe one day I will), but the main thing it says from my point of view is that there might be some release of Safire in the next few months. I'd love to see that. I've been watching this blog for ages, and it would be great to see a real application or OS come out. Let's hope it works out for 2007. Looks like the first version will be available in the next few days. I messed about with the iSpin Launcher ages ago when it was first free. I had a look today and found this image on their forums. It seems that the idea of iSpin 2.0 and using a form of multi-tasking has never really come about, which is a shame. It looked like fun. I'm looking forward to seeing the final product of the Screens Project. The Safire application. I'm waiting for a day when I can run all sorts of environments on my Palm doing various kinds of multi-tasking. The future is all Sagauro and Safire. 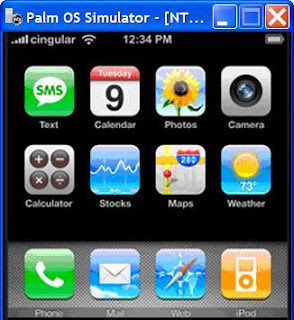 Now that the cat is out of the bag and Apple really have developed a phone which contains OSX in the device, what will happen to handheld operating systems like Palm and Windows Mobile? Will they really survive? But, I expect that is just the start. I predict that there will be a growing application ecosystem for the iPhone. 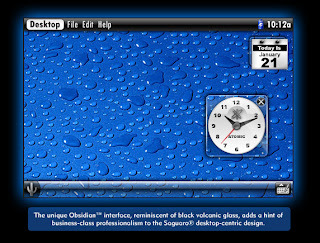 If developers can easily convert / adapt their applications to run on the handheld version of OSX (if indeed it is a "version" of the OS). If developers can do this easily there will be a large portfolio of apps around for the iPhone. With a big app portfolio running on a powerful robust multi-tasking OS, how will the other platforms respond? Will they be able to compete at all? I bet that within a few months or sooner we'll have versions of many other popular applications enabling functions like making small movies on your phone, podcasting on your phone, word processing and spreadsheets, and many more. I think that the iPhone really will change the mobile phone market, but in a way that will make many users realise just what a smartphone should be about. It seems like the first release will only use Saguaro bespoke applications, but later releases will allow legacy applications to run as well. I had only just heard about this. It looks totally amazing. Wow, I can't wait to try it out.